Positioned at the foothills of the Virunga Mountain chain, Mount Gahinga Lodge is one of the top notch lodges that offer overnight stay to the Uganda gorilla safari tour travelers in Mgahinga Gorilla National Park. Known to be Uganda’s second Mountain Gorilla refigium and thus another destination for Gorilla Safaris in Uganda, Mgahinga Gorilla National Park boasts of one habituated gorilla family in the name of Nyakagyezi. 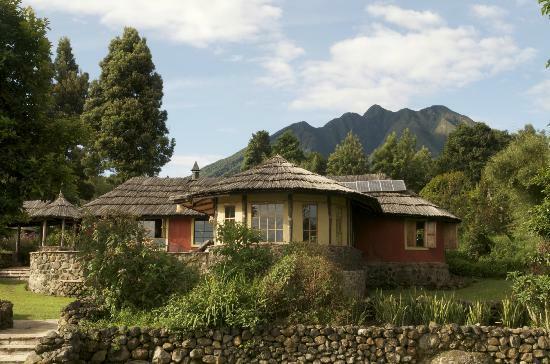 However, Mount Gahinga’s Lodge service goes beyond the gorilla trekkers and act as a perfect base to explore other magical wonders that the park has got to offer. With three of the eight Virunga Volcanoes namely Mount Gahinga, Sabyinyo and Muhabura rising to 3,474m, 3,669m and 4,127m above sea level respectively, Mgahinga Gorilla National Park offers exciting volcano climbing adventure for the travelers on adventure vacation safaris in Uganda Africa. The troops of Golden Monkeys also dwell on the slopes of Mount Gahinga while the historical Batwa heritage trail to their ancient homeland are all available for exploration in Mgahinga Gorilla National Park and Mount Gahinga Lodge is capable of offering a perfect needed accommodation. Mount Gahinga Lodge features a main building that has a spacious living area, fire place, sun room connecting to the living area and an outside terrace cozy for chilling after a long day in the Mountains. The Bandas number to six (6) configured as 3 double and 3 twins all en suite with hot water and flush toilet. Private Veranda and the 240v lighting mark each Banda. For the travelers on Gorilla Safari in Uganda with interest in keeping in touch with the world, the Free Wifi is available in the main building.